Estrella 4-H Equine Leader and an accredited Richard Shrake instructor and coach. Halley works with a variety of issues including, but not limited to: symptoms of anxiety and depression, eating issues, substance use disorders, impulse-control problems, partner and relational problems, occupational problems, and parent-child problems. Halley supports the human-horse therapeutic connection and plans to make equine therapy a part of her private practice in the future. Dr. Moore is currently located at Center for Counseling and Recovery in Paso Robles. I started Heaven Can Wait because of a promise I made to a horse when I was 15 years old growing up in the San Francisco Bay area during the unforgettable 60’s. While taking care of him for his owner who, because of an accident, could not ride for a year, an incredible bond was formed. He was what I loved most and trusted completely in a turbulent decade and turbulent family life. He saved me from what might have been a disastrous end. As I said goodbye to him a year later not knowing what his fate was going to be, I cried from deep within my soul and promised him I would always do for other horses what he did for me. Almost 25 years later, I found myself back in California after working and living in the Washington, D.C. area. The time had come to do something I had wanted to do for years; take riding lessons and eventually purchase a horse. That horse, now in heaven, took me into the world of “western horse shows.” My eyes were opened further to the fate of the horse. As we traveled to many shows throughout the State, I witnessed the abusive training methods of many trainers. Thankfully, some of those methods have since been banned, but the memories never left me. In 2002, almost 40 years after that incredible bond was formed with a horse in the 60’s, my husband and I moved to Paso Robles bringing with us my 3 show horses, all of whom were retired. Shortly after we moved here, because of a telephone call from our co-founder, the first 3 rescues arrived. It became apparent that my promise to an old friend was coming true. 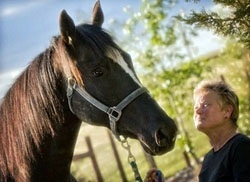 Heaven Can Wait, a 501(c) (3) equine rescue and sanctuary was opened. We rescue horses and donkeys from abuse, neglect and abandonment caused by cruelty, ignorance or financial need. We act on the belief that these noble animals, which we have relied on for so long for our own survival, deserve to live in comfort, safety and good health until their days are done. Each rescue, whether already in Heaven, still with us, or future ones to arrive at Heaven Can Wait will always carry a big piece of my heart and soul.